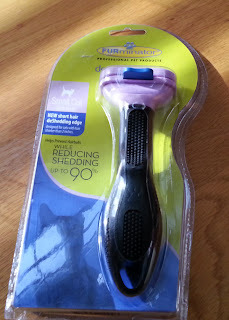 Recently, the folks at Chewy.com asked us if we'd like to review a new product they now carry - the FURminator - and we said we'd love to. So they sent us links to the FURminator deshedding products they carry and asked us to pick one. We chose the small comb for short hair. You may have noticed we called them Chewy.com - as opposed to MrChewy.com. Yep, they've changed their name. But they're the very same company with great customer service. The FURminator arrived in very short order and Faraday set out to inspect the new package. To be quite honest, it didn't look like a toy or smell like catnip, so he was a bit unsure what he thought of it, as you can tell by his expression. But no worries - he's not the one with occasional hairball issues - Allie is. You see, although Allie is a short-haired tuxedo girl, we were surprised to discover that she has a thick undercoat. Thankfully, she loves to be groomed. Which is good, since the best way to manage hairball issues is to not have her ingest all their fur in the first place! 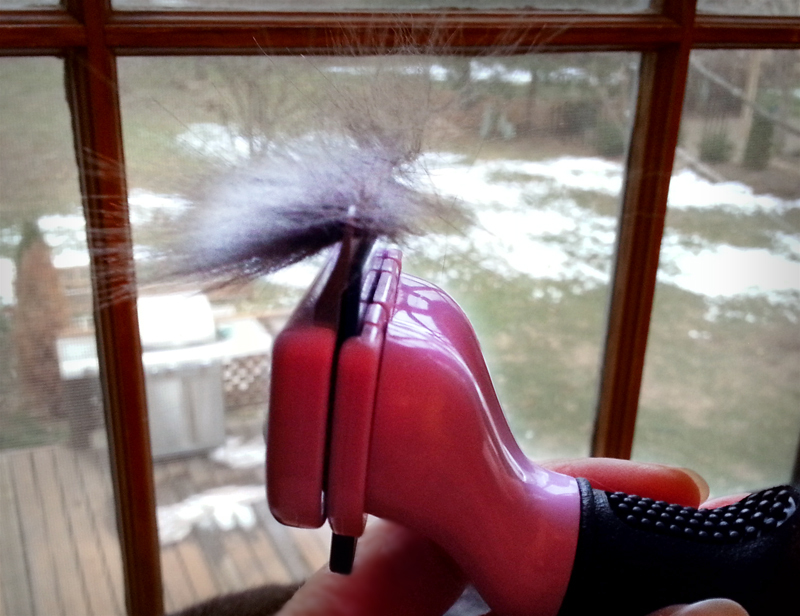 So we unpacked the new FURminator and took it for a test spin. 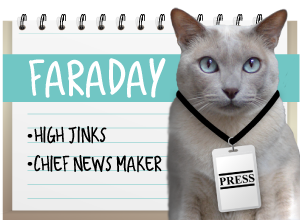 We did offer Faraday first crack at it - and we got airplane ears, so decided to move on. You aren't seriously going to TOUCH me with that thing, are you? Allie loved it. She was careful to oversee her spa day, since she is quite particular about how she looks. Be sure you don't miss a spot, Mother! I have to say, this is the most effective grooming tool I've ever used. Ever. Same number of strokes with each tool. No contest! 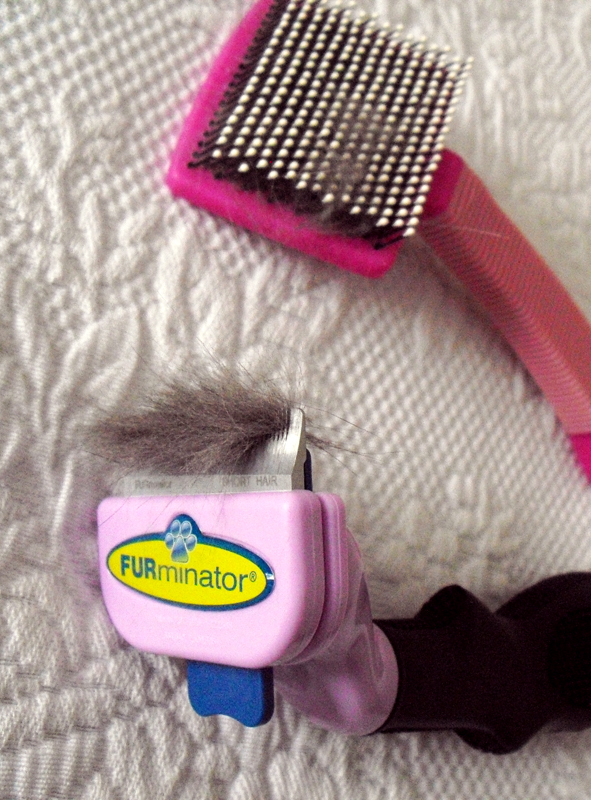 The FURminator we received has an easy cleaning button at the top that helps remove the accumulated fur. 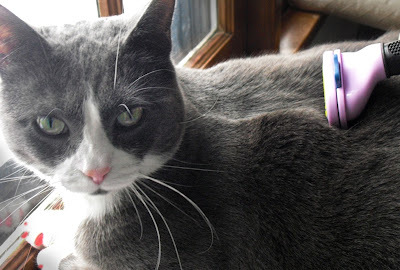 In all, we can't say enough good about this product - we'd been hesitant to purchase this in the past because it is more expensive than generic cat brushes and combs but it simply blows away all the other products we've ever owned, so we say it's well worth a few extra dollars (they retail for $37- $43). 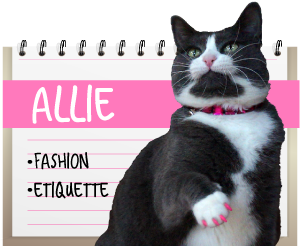 Allie gives it her full endorsement - and we humans do as well! Mommy just ran out to buy a replacement bug for our Neko Flies (SOMEkitty trashed it... ALLIE...) she discovered that our local pet store charges more than Chewy.com! but she'll be ordering all future refills online at Chewy.com. Many thanks to Chewy.com for the FURminator. 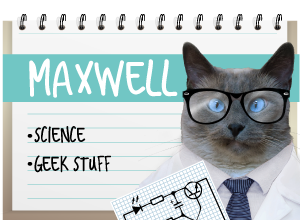 By the way, we order our food & litter from them, and shipping from Chewy.com is a breeze. There's free shipping on every order $49 and above, and anything less is a flat, reasonable $4.95. 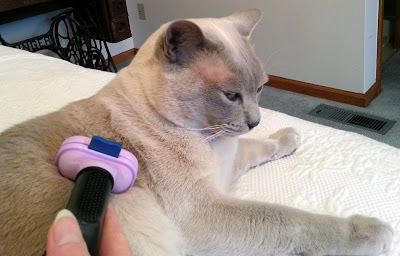 Chewy.com graciously gave the FURminator to us to review, but all opinions are strictly our own. Alex loved his furminator! When ever we used it, I'd joke we removed so much fur we could grow another cat! 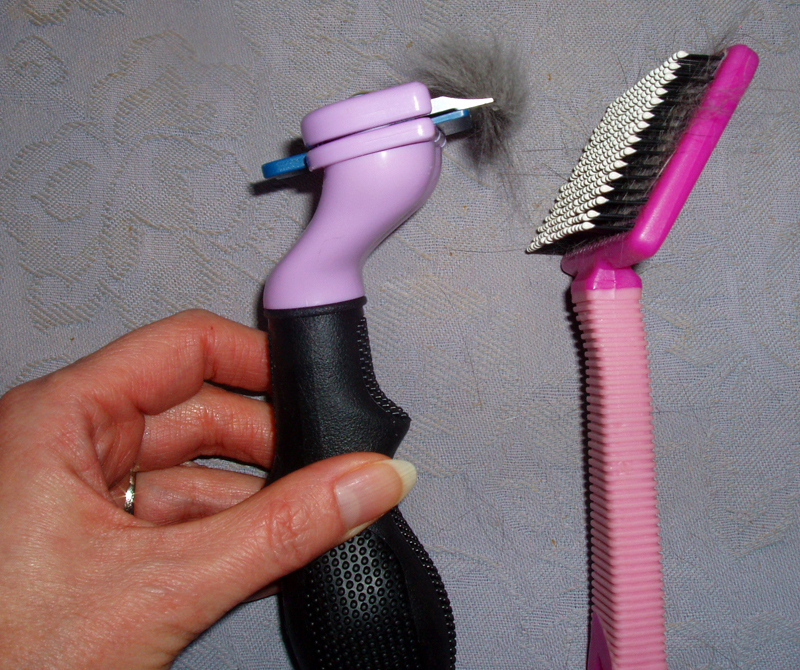 Thank´s for your review on the Furminator ! Yikes not the dreaded furminator. We have one of those and it does a great job but I don't do Spa days unless I have to. Have a super Sunday. Mom so wishes I would let her brush or furminate my long fur, but I am like Faraday. maybe Audrey would still benefit form some furminating with her shorter fur. Gee...of all the products I've seen reviews for, the Furminator gets the most PAWS UP for the job it does! I may have to break down and let Mom get one for me. I get brushed a LOT because I love it so I'm sure this would feel just as swell as my regular brush. Great review - Allie you look bootiful after your grooming! We both love our furminator which we have had for a few years now. Eric used to suffer badly with hairballs but only occasionally gets them now. I LOVE love love my FURminator. I've done many posts and videos showing Pop combing me. That's where all the fur in my Christmas cards comes from. He gets a ton of fur offa me. You gonna love it too Allie. The Furminator is GREAT. Sammy likes when we use it on him, and we always get so much fur! We call the giant ball of fur a "baby Sammy." We've had a regular Furminator for a while although we don't use it that mush since we all have pretty short hair. However.... #1 recently bought an Equine Furminator and she is really looking forward to trying it out on the Vs in the spring! We love our Furminator too! We agree, it is the BEST grooming tool out there. 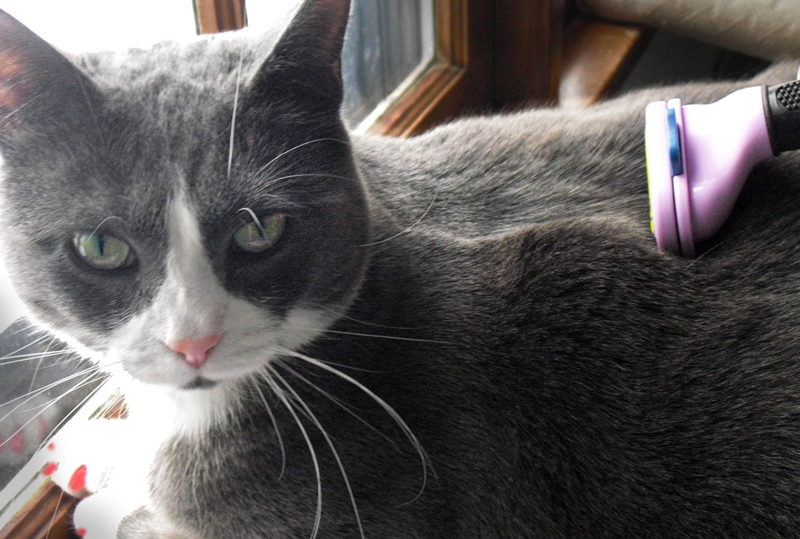 I'm one of those rare kitties that HATES the furminator. If M even takes one tiny stroke down my back, I give herd "that look." Actually I don't like being brushed much either but will tolerate it for ahwile if I'm nice and comfy on a lap. M says nothing removes fur like a Furminator, and she wishes I'd let her furminate me. it is awesomely effective, but pretty much my whole crew hates it. But I'm able to get more done in a short time with it than I can with the amount of time they let me groom them with their other comb, so I keep it in rotation. We get all our foods from Chewy. In fact TWO big boxes just arrived yesserday! Tatiana almost tolerates the Furminator. Bailey loves it. Sushi lets us do what we want to him with it. It works wonders! Great review and we LOVE our Furminator. Cody has one and will jump up on his tower for either my husband or I to use it. We also LOVE chewy.com and order litter and other things from them. They are great! Allie is such a princess! We love Chewy.com and we order from them a lot. We have 3 different Furminators. They work GREAT! But we still hate getting groomed. We have one of that, too!!! But I like the normal brush better. Mom Paula uses the Furminator on us to get out mats, but with our thick, long fur, it's not the best to use on us for general grooming. Mom Paula uses a good comb on us to get through to the undercoat. We just received our dry food and some treats from Chewy.com. We love using them. Waffles Too thinks it's a chew toy. Stupid kitten is going to crack a tooth for crying out loud. ...good to know on Neko. Our local shop charges two paws and a tail for refills! We has gots to get one of those before Kozmo starts loosing his winter coat! 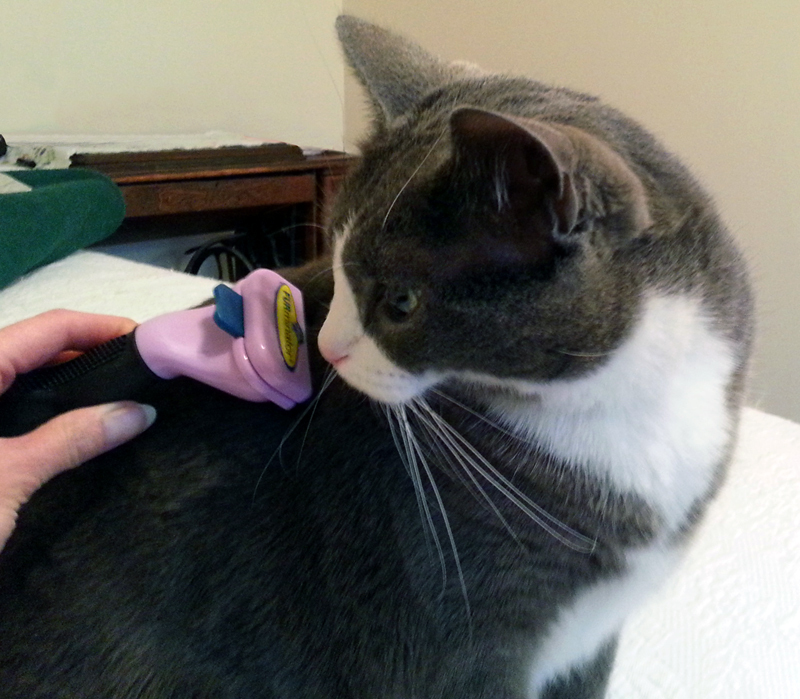 I adore my furminator. (Actually, I LOVE being brushed with anything, even a flea comb will do.) 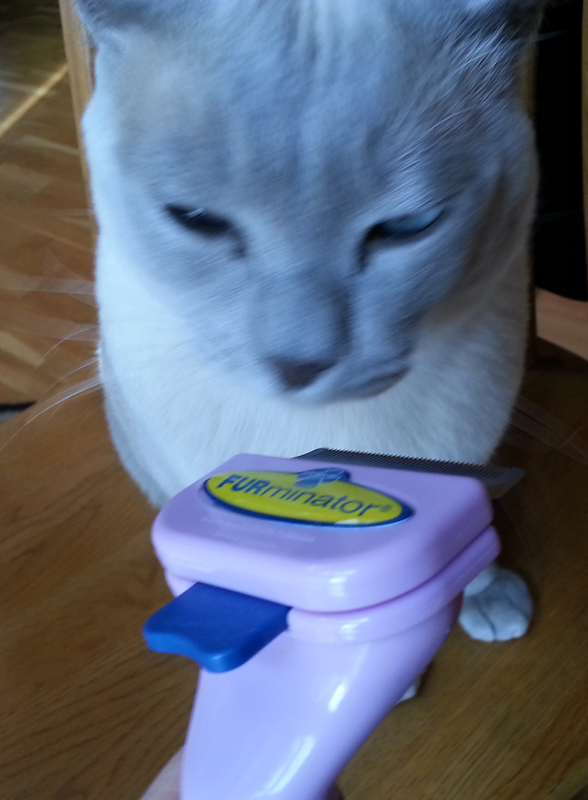 I have the double-bladed one and it removes so much fur, mommy swears I must weigh less after the treatment! Purrrrrrrrrrrrrrs.